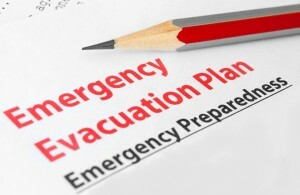 You need to have an emergency plan for dealing with a fire situation. The purpose of an Fire Emergency Plan is to ensure that the people in your premises know what to do if there is a fire and that the premises can be safely evacuated. If you or your organisation employs five or more people or your premises are licensed or an alterations notice requiring it is in force, then details of your Emergency Plan must be recorded. The document should include a detailed fire evacuation plan of how people will get to safety and where they will assemble. Even if it is not a requirement, it is good practice to have a plan! Plans to deal with people once they have left the premises.